AirPlay Mirroring is one of the coolest features on iOS. As the name suggests, it allows you to mirror your iPad screen to a nearby Apple TV or a Mac – so everything done on the iPad is shown instantly on the bigger screen. This is a superb feature for presentations, screencasts and demos, and for entertainment and gaming. 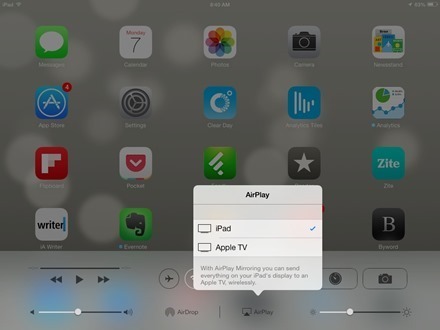 In iOS 7 the controls for AirPlay Mirroring have moved. In iOS 6 they were found on the Multitasking Bar where you switched between recently used apps. 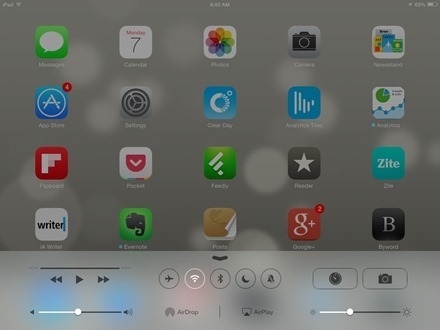 iOS 7 now uses a card style view to show running apps and switch between them – and the controls for AirPlay Mirroring are no longer shown along with those. — Swipe up from the bottom bezel (the black area just below the iPad dock). — This will bring up Control Center, where you have quick access to many useful controls. — Right in the middle of the bottom row of Control Center you’ll see the Airplay icon, as shown in the screenshot at the top of this post. — Tap on the AirPlay button and then tap on Apple TV to mirror to that device, or on iPad to, in effect, turn mirroring off. * Please note: a 3rd party app is required to use AirPlay Mirroring from iPad to a Mac. I don’t seem to have those options when I swipe up my Control Center. It is just blank. I have updated to 7.0.2. Any suggestions? Reboot the iPad I’d say. My Control Center doesn’t have AirPlay or Air Drop showing on it. What do I need to do to have them show up. I need to get this in place for a webinar next week. I believe you need to have an AirPlay device detected (i.e. your phone should be on the network and able to discover your AppleTV. Mine doesn’t show when I’m at work but does when I’m home on my network with the AppleTV. I have a 3rd party app on my computer to AirPlay Mirror from my iphone to it, Yet when I do it, and I enable mirroring, it just unchecks the computer and checks just “iPhone” again. I’m using iOS7 and it worked on iOS6. The AirPlay icon does not show up until you’re actually listening to a song on iPhone5.